With over 1500 stores worldwide, including over 150 in the UK, Mail Boxes Etc (MBE) is one of the world’s largest non-food retail franchises. And now you can be part of this success story as an exciting opportunity has arisen to own Mail Boxes Etc York. Established over 20 years ago, MBE franchise York is now for sale due to the current owner looking to relocate. The York store currently serves a population of around 200,000 people with over 110 rented mail boxes providing a regular guaranteed income. Our services include - local and international parcel delivery via a choice of big-name carriers, expert packing service, Royal Mail postal services, print, copy, finishing, and design, office supplies and stationery, plus support services such as internet access, scanning, fax and telephone answering that help to make us a useful support hub for local businesses. One area of growth and potential ongoing development opportunity, is our partnership with the auction and antique sector. We are well positioned to provide comprehensive collection, packing and shipping services to online auction buyers, and work in close partnership with many auction houses over a wide geographic area extending to the East Coast. As well as the auction and antique sector, our core customers range from members of the public to small businesses, students and overseas visitors. No resales in your area? 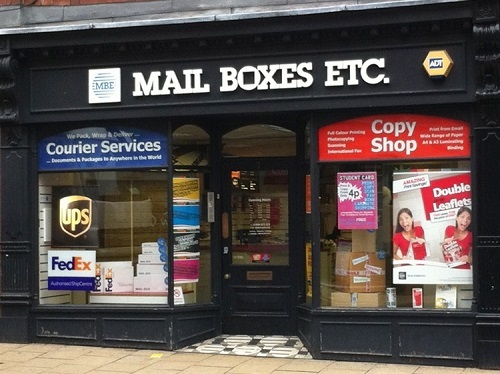 Why not enquire about a new franchise with Mail Boxes Etc.